The X-tend series offers solutions to many design problems. 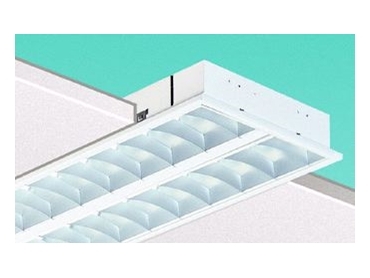 PHILIPS Lighting has released a new generation of fluorescent luminaires designed to provide optimum lighting for workplace environments. Called X-tend, the range features Philips’ newly developed optical concept based on specially designed lamellas that are curved in 3 dimensions, each being topped with fresnel mirrors. The concept is called omni-directional luminance control (OLC), it gives increased efficiency (increased light output ratio) by avoiding all unnecessary internal obstruction of light. The design gives optimal glare control in all azimuth planes with minimised patch luminance, while also maximising beam spread giving good uniformity. There is a comprehensive range of housing styles including recessed and surface mounted/suspended, in many configurations for T8 and T5 lamps, with standard and HF gear. The X-tend series offers the lighting designer solutions to many of the design problems associated with providing good lighting. The precise optics and light distribution provides a comfortable environment for superior visual function. The contemporary look of the luminaires will provide interiors with enhanced visual and architectural amenity. The suspended direct/indirect types give a valuable uplight component that contributes to the sense of visual "lightness" while the downlight takes care of the task. The luminaires and lamps are highly efficient with long maintenance intervals helping to minimise the life cycle cost, or total costs of ownership.